I have a lot of students at UF who are interested in the STEM and STEAM movements in education. It makes sense since these initiatives are getting a lot of attention (read: funding), and provide avenues for project-based learning connected to real-world issues and ideas. Cora and I recently fell in love with two picture books that could be used to illustrate STE(A)M concepts and learning. 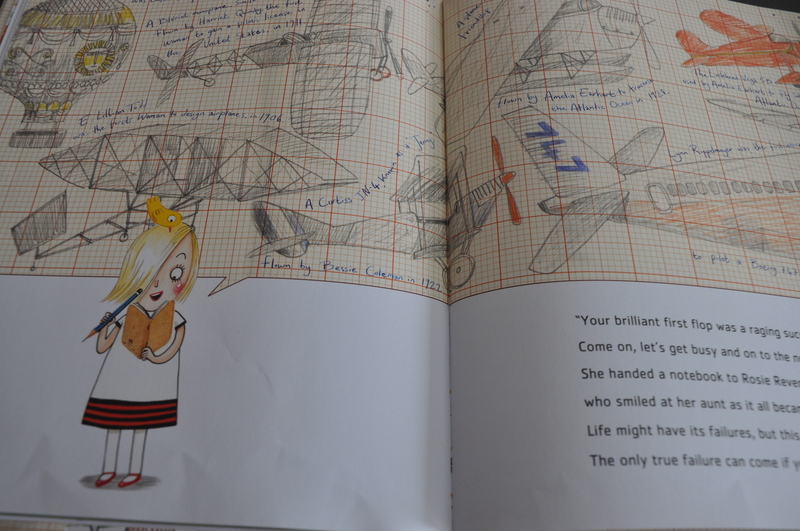 Rosie Revere is a tinkerer. She repurposes found objects into all sorts of wild inventions. Her Great Great Aunt Rose, a “Rosie” who worked on planes during WWII, comes to town just in time to encourage her to follow her dreams when she is about to give up. The story and illustrations effortlessly weave together the history and contemporary position of women in male-dominated roles. In so doing, these two Rosies subtly invite more girls to play an active role in shaping the world we live in. The Three Little Pigs: An Architectural Tale (Guarnaccia, 2010) is a welcome alternative to the old classic that anyone with an appreciation for modern architecture and design must check out. Fans will immediately recognize the styles of Frank Gehry, Frank Lloyd Wright, and Phillip Johnson – both in the pigs attire and the shelters they construct for themselves. The book deftly makes use of these men’s most famous works as stand-ins for straw, sticks, and bricks. This is one of those picture books that could very easily find a home outside your local elementary school. This entry was posted in Picturebooks on the Potty and tagged Frank Gehry, Frank Lloyd Wright, Girls and STEM Education, Girls with Tools, Inventions, Phillip Johnson, Rosie Revere Engineer, Rosie the Riveter, STEAM education, STEM education, The Three Little Pigs, The Three Little Pigs: An Architectural Tale by jodiK. Bookmark the permalink.